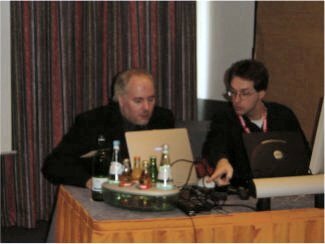 The following is an excerpt from the UniversalThread conference coverage of the German Visual FoxPro Developer Conference 2003 written by Hans-Otto Lochmann and Armin Neudert. This track consists of 4 sessions presented on one day in one sequence. 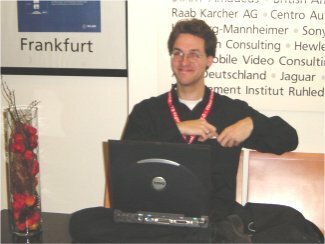 Originally the Linux portion of this track was to be presented by Whil Hentzen, the well-known publisher, book author and confer-ence speaker. Unfortunately some illness prevented him from joining this DevCon. Rainer got the bad news only on early Friday morning. It was definitely to late to find a replacement among the already invited speaker on such a short notice. So Rainer decided to take over these "three sessions in a row" by himself with "a little help from his friends". He hired a coach for him for the weekend and prepared slides and sessions by himself - the originally planed slides and session material were still in USA. Rainer survived barely an endless disaster of C0000005's due to various wrong configuration settings... At the presentation Jochen Kirstätter helped massively with technical details regarding Linux whereas Rainer did the slides and the presentation. Gerold Lübben then presented the MySQL part - as originally planned. This track concentrated on the how to run Visual FoxPro applications on Linux machines with the help of a Windows emulator like Wine. As more and more people use Linux machines in production (and not just for running servers), more and more invitations to bid for a development job includes the requirement to run the application in a Linux environment. If you would like to participate in such submissions, then you should get familiar with the open source operating system Linux and the open source Data Base system MySQL. First, plunk down a Linux workstation on your desk next to your Windows machine and develop some experience with the new OS. Second, once you have a basic level of comfort with Linux, gained through your experience on a workstation, leverage that knowledge and learn to connect to a Linux server from your Windows machine. This track showed both of these processes: What you can expect when you set up your Linux work-station, how to set it up, how to connect to your Windows network, how to fit VFP into the mix, and even how you could use it to replace your Windows workstation in some cases. Also this track demonstrated how to connect to an existing Linux server, running MySQL or an another back end, and how to get your VFP apps talking to that back end data. This track also showed both of the positions you can take. Rainer disliked it wholeheartedly (the bad guy position in these talks) and Jochen loved it (the good guy and "typical Linux techie"-position we all love). These opposite position lasted for three sessions and both sides where shown with their Pros and Cons in live and lively discussions of the speakers (club banging was forbidden). Gerold Luebben showed how Visual Foxpro and MySQL can work together. MySQL is as one the most well known open SOURCE databases for nearly all platforms available. Particularly in eBusiness MySQL is well positioned and well known for its performance and its stability. Still we like Visual FoxPro more - for sure . 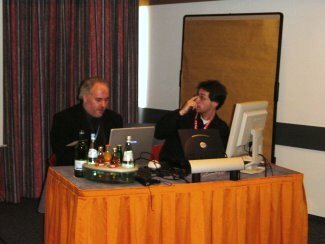 Several technical sessions on Active FoxPro Pages 3.0 (inclusive night session) at the annual DevCon Frankfurt in 2004. State of VFP running on Linux.